A big mistake. A quest for revenge. Now Hell has a new bounty hunter. It was all a big mistake. Christopher Sawyer never wanted to be Hell’s bounty hunter, and he was pretty sure Hell didn’t want him for the job either. But mistake or not, he is now the master of the Book and Blade and charged with becoming the Hunter of Lost Souls, tracking down escaped dark souls and returning them to their prisons in Hell. Now Christopher must master the power of Hell inside of him if he hopes to survive this new reality. And if he can get a little revenge in the process, all the better. Book and Blade: His simple college life shattered and his family taken from him, Christopher must figure out how to use his new-found abilities to hunt down the dark soul responsible. A dark soul that is in league with the most powerful crime organization in the city. Eater of Souls: A new type of creature has escaped the underworld. A monster that likes the taste of human souls. And it is not working alone. With the help of a young woman cloaked in her own mysteries and a cynical police detective, Christopher must find a way to defeat it before it unleashes its own hell on earth. The Demon Collector: Christopher’s latest hunt will take him from New York to the slums of Mexico. To make matters worse, the dark souls are united, and they have a new weapon, a recruit fresh from the underworld. And he’s brought a whole army with him. This first omnibus of The Hand of Perdition contains the first three books of this thrilling urban fantasy. 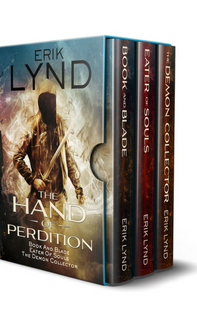 If you like fast-paced urban fantasy, vile demons, and dark supernatural forces, then you will love this new series by Erik Lynd.